“Just thought I would drop you a line and say good-bye, as I have left the cold of the English winter behind me and I’m now working down under,” says (former) GruppeM race engineer Adam DeBorre. So it’s back home for the personable Aussie – who the Ed. 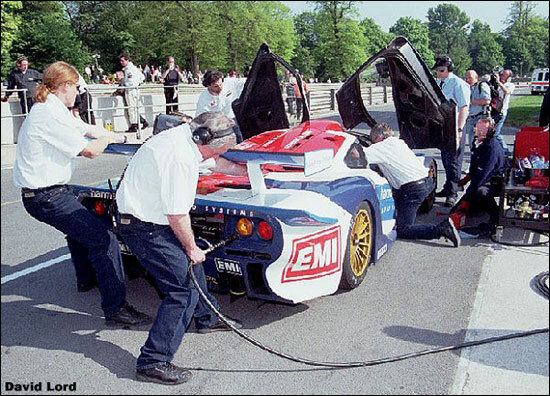 first came across in British GTs, helping to look after the late Steve O’Rourke’s McLaren (below – Adam sporting the pony tail). Since then, he’s typically been engineering whatever Tim Sugden has been driving (GruppeM and J3 in recent seasons), and during 2005 he looked after the #88 GruppeM Porsche. 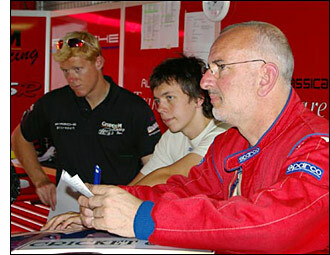 He’s pictured on the right with Jonathan Cocker and (#66 engineer) Dr. Steve Bunkhall. Adam was always inclined to look at alternative race strategies, and his plan at the FIA race at Istanbul last year worked a treat: the story of that ploy is here. He always had an interesting tale to tell – most of them not for these pages – and we wish him all the best back home.